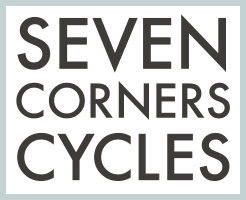 Seven Corners has all the parts and knowhow to handle any task on your bike, wheelchair, or even stroller if need be! Our mechanics are not only precise, thorough, and efficient, but they’re downright some of the friendliest people you’ll ever meet. Bring your bike on by for a quick estimate, and let us surprise you when we get you fixed up faster and for less cash than you thought. With decades of combined experience across our service department, we know that every bike and customer’s needs are different. Think of these prices as “worst case scenario” guidelines for tune-ups, builds, and overhauls. In many cases, we’ll have your bike working better-than-new for far less! $70, including installation of cables, housing, and brake pads.